Paddy Power Casino giving their customers up to £25 free in their Rocky Reload promotion – all you need to do is play their slot games. 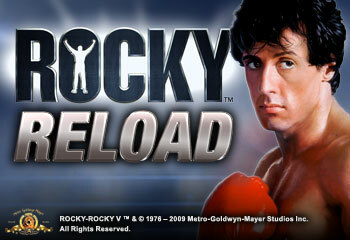 The Rocky Reload promotion is available today only (Wednesday the 25th of March) – you need to simply opt in and stake a minimum of £100 on the allowed slot games. You will be rewarded with £5 free for wagering £100, £10 free for wagering £200 and £25 free is you wager £500. Finally, you need to play 50 spins (transactions) to qualify for the Rocky Reload bonus. When it comes to slots, Paddy Power Casino are powered by Playtech software and offer a large variety of quality slot games. You have popular titles such as Great Blue, Gladiator and King Kong. We also recommend you play the Marvel slots such as Fantastic Four and Iron Man 2. You should try Iron Man 2 which has 50 paylines. Based on the comic book hero, it has symbols stacks in 2s meaning that symbols take up 2 spaces on a reel – this can significantly increase your chances of winning. In terms of features, look out for the Free Games with Increasing Multiplier feature – you will be awarded with 10 free spins and the multiplier increases after ever 2 free spins. For example, for free spins 1 and 2, you’ll get a 2x multiplier but for free spins 9 and 10, you’ll get a 6x multiplier. Furthermore, you will see an additional wild symbol stick in the middle position of the 3rd reel for the whole free spins bonus round. Finally, you can trigger one of the Marvel Mystery Progressive Jackpots with the top jackpot current at £233,418.33. You can combine the Rocky Reload promotion with Paddy Power Casino’s £5 no deposit bonus – all you need to do is sign up and you will get the £5 instantly to play with. You can also get a 100% welcome bonus up to £200.